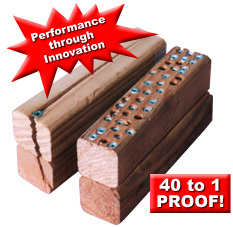 When the project demands a high quality, finished appearance, insist upon SplitStop™ high performance wood screws. Experience the ability to place wood screws within 1/8" of the edge of a board without splitting the wood. Install deck boards and railing balusters with little fear of splitting! Penetrate knots without shearing-off screw heads! Countersink effortlessly, even in Oak! All without predrilling! Drive angle is increased without slipping or bruising of recess. Available in 5 Finishes. What is ACQ Rated finish? Rust resistant finish that is comparable to a common galvanized screw. Splitstop Zinc-Yellow Wood Screws are a great choice for cabinetry, woodworking and all other types of interior projects. Limited availability of box sizes.